WATCH HILL, R.I. — Eight decades ago 39 houses dotted the 1.5-mile-long sandy peninsula that juts westward into Little Narragansett Bay. The 1938 hurricane wiped out those structures, and severed the connection to Sandy Point, now a mile-long island shared by Rhode Island and Connecticut that is a popular summer spot for boaters. In the years that followed the hurricane, developers sought to build cottages, and other manmade structures were proposed. None were approved, and today the Napatree Point Conservation Area is a protected peninsula that offers sweeping views of Little Narragansett Bay, the Atlantic Ocean, and New York’s Fishers Island. Napatree Point is owned, managed, and protected by the Watch Hill Fire District, the Watch Hill Conservancy, the town of Westerly, the state, and private landowners. Conservation easements protect it from future development. On Oct. 15 ecoRI News toured the area with two of Napatree Point’s biggest advocates: Janice Sassi, the property’s manager, and Peter August, a professor at the University of Rhode Island. It was a rainy, windy and overcast day. Few other people were seen during our hour-plus adventure. In the summer, however, that isn’t the case. Finding a scrap of beach to hunker down can be difficult, and some areas are roped off for important visitors, most notably piping plovers and American oystercatchers, both of which nest in the sand. This collection spike has lessened the environmental damage Mylar balloons were causing on Napatree Point. The summer’s sudden influx of people leaves an impact, from carelessly discarded trash to well-worn footpaths. To help reduce the stress of humanity on the area’s fragile ecosystem, August had to install a collection area for Mylar balloons. This past summer “a few hundred balloons” were impaled on August’s contraption. “Respectful enjoyment is the goal,” Sassi said. 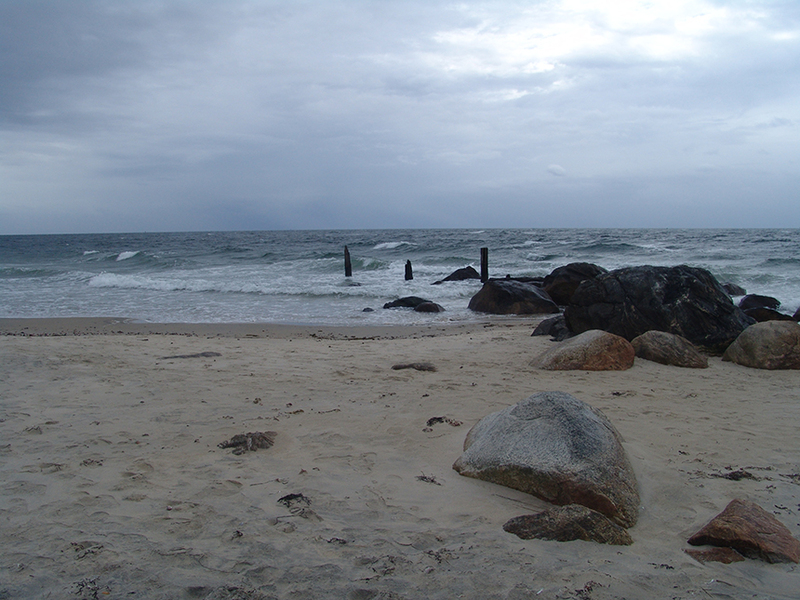 Napatree Point is a barrier beach system that has been shaped and reshaped by storms, sometimes profoundly, as was the case with the hurricane of 1938. Erosion is a natural occurrence, because the area is a sandbar composed of more sand than soil and its shoreline is worked upon daily by ocean waves and the tide. The peninsula’s entire coastline will eventually disappear. To help protect the area from storm surge, coastal erosion, and human visitors, a number of plant restoration projects have been undertaken during the past several years. During that time, 3,500-4,000 native plants, many supplied by Rhody Native, have been added to attract pollinators and help anchor the peninsula’s shifting sands. Restoration projects are being undertaken to help control erosion and lessen the impacts of humans. In 2015, for instance, the Watch Hill Conservancy received a $20,433 grant to restore barrier-beach vegetation. The project expanded upon efforts previously funded by the Coastal Resources Management Council and the URI Coastal Institute to control invasive plants and plant native species that will provide erosion control, improve habitat value, and decrease the area of walking trails that allow for human disturbance of the property’s delicate dune system. August, chairman of the Science Advisory Committee of the Napatree Point Conservation Area, said detailed records are being kept on those plants to indicate which ones are thriving and which ones are struggling. Some are being eaten. Split-rail fences also have been erected and yellow signs posted to keep visitors, pulling kids and wheeled coolers, from making their own paths from the peninsula’s protected side to its open-ocean side. At one point a few years ago 50 crossover paths had been trudged through Napatree Point’s dunes and vegetation, according to Sassi. Napatree Point is recognized as a national model for natural area stewardship and caters to an abundance of life, including many bird species such as semipalmated sandpipers and osprey, horseshoe crabs, mussel beds, bats, minks, foxes, deer, marsh hawks, and monarch butterflies. The Audubon Society has recognized Napatree Point as a globally important bird area. The Napatree lagoon, 3.5 feet deep in the middle, is home to a half dozen different kinds of fish, including the American eel, and green crabs are abundant. So are people, but not during this time of the year. Editor’s note: For a detailed look at Napatree Point, including its history, wildlife, stories, pictures, and videos, click here.